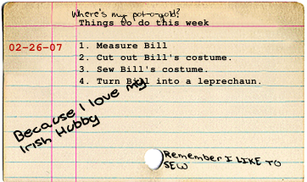 I really was going to start the leprechaun costume yesterday. I was...I swear I was. But, I didn't. 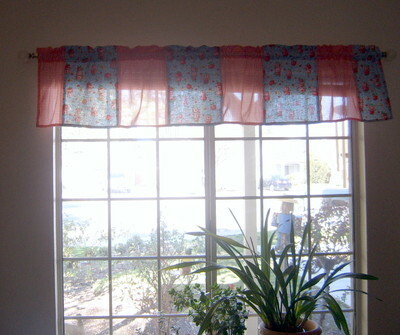 Instead I decided to take down my old curtains and make a new valance and matching pillows for my couch. I love Cath Kidston's style but, I obviously don't live in England and can't afford her stuff on Ebay. When I saw this material at my local fabric store it reminded me of her style and I had to have it. 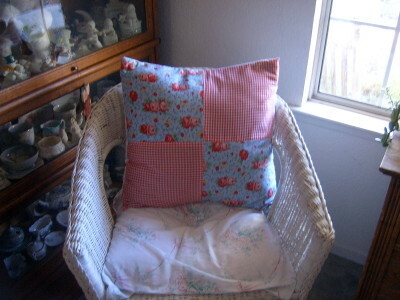 I used the red gingham from my old curtains and combined it with the new fabric and voila...new pillows and a valance. Sew cute! Now, I really am going to get off the computer and start that leprechaun costume. Struck out at the local woman's club rummage sale. Well I did get the sweet rose scarf for a quarter. 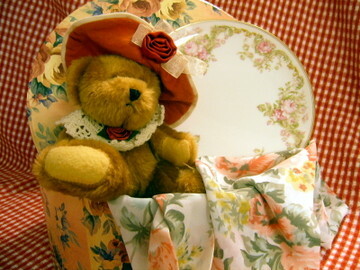 I found the cute bear and the Haviland plate at my favorite thrift store . The bear was a $1. and the plate was 65 cents. I love the plate with the pink roses. It was so cheap because it has a tiny chip on it. I didn't care. I'll put it in a plate holder and the chip won't show. My best friend went to the rummage sale before me. She found the pretty hat box and a really cute picture frame for me. Funny how they all go together. We usually go together but Friday was my wedding anniversary and my hubby volunteered to go with me. He stood around in the middle of the woman's club looking lost. I took pity on him and skipped the clothes racks. I did see some beautiful blouses being rang up as I stood in line to pay for my scarf. We had a nice day hanging out together. How lucky am I to find someone who will go thrifting with me and then take me out for a nice dinner and a movie. The movie was his choice, "The Breach" but, I loved it. It was intelligent and suspenseful and not just one of those typical male shoot em up movies. In Napoli where love is King,. And you'll sing "Vita bella." 'Scusa me, but you see, back in old Napoli, that's amore. Oh wow! Look how cute this turned out. I found this vintage dish towel at an estate sale and I wasn't sure what I would do with it. I turned it into two cute purses. One for me and one to sell on ebay. I'm really jumping in feet first now. I have sold at boutiques for years and have now decided to take it to ebay. I've been doing lots of sewing. I wanted to list some vintage treasures on ebay but the weather is rainy and dark so I can't get a good picture. I know I left you all hanging with Colleen and Kevin on Young and the Restless. Well they were rescued. Colleen is in a soap operaesque (I made up that word) coma and Kevin is being accused of trying to kill her. That evil little English missy better not get away with it! Saturdays should be for sleeping in. That is what I did before I became addicted to estate sales, tag sales in some areas. I head out on Saturdays with a little money in my wallet and an eye for spotting treasures. Sometimes I find a treasure. Someone said "One man's junk is another man's treasure". In my case I look for kindred spirits. A few weeks ago I walked into a house and I felt at home. There were rose plates and rose stitchery and all kinds of pretty things everywhere. For $12. I walked away with a rose wreath for my front door, 6 Valentine's place mats, a Valentine's runner for my table, a cross stitch pillow and eight plates that I absolutely love. Two of the plates are Steubenville and I paid just fifty cents a piece. On ebay someone is selling the same plates for $10. each. Score! The vintage angels and choirboys were a thrift store find that I plan on listing on ebay. I actually found 7 of them, but I am keeping the dark haired boys. They were in a ziplock bag on a bottom shelf and I saw a lady pick them up and study them. I held my breath until she set them down and then I snatched them up. One man's junk...my treasure. If a picture is worth a thousand words then this post should be long. This little shelf that I turned upside down and added pegs to is hanging in my home. On it is a favorite card from my daughter that says "My Mother's Garden". My children are the flowers in my garden. I nurture them and watch them grow. My daughter is almost 23 and newly married. My sons are 21 and 14 and live at home with me. I'll tell you more about them later. Yes, I'm one of those moms who loves to talk about my wonderful children! haha The little owl belongs to my husband. He is like the owl. He is wise and calm and his presence soothes me. Look close and you will see my angels. They represent my loved ones who are no longer here. My San Francisco Giants hat exposes me as a girly girl tom boy at heart. I love pink, children, baseball, my husband and old things, not necessarily in that order. Well, here I am. I am jumping feet first into blog land and I'm not even sure where to start. I've been reading blogs for a few months now and have become totally addicted. Every day I have blogs that I think I have to visit. I usually spend too many minutes, if not hours, clicking on links that take me to more and more lovely blogs. 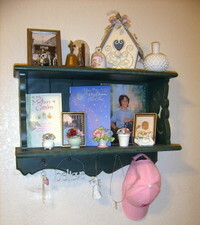 I love the blogs by the many crafty, thrift store searching, treasure hunting women like me. I have also become almost compulsive about hitting the thrift stores in hopes of finding something I have seen on a blog. 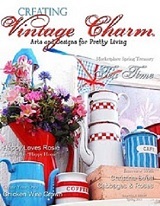 I love everything that is vintage handmade...from embroidered hankies to old vintage collars. I collect almost anything with vintage roses on it. I am slowly amassing a collection of dinner dishes, one at a time, to replace the boring blue ones I have now. I love to sew and create new things. 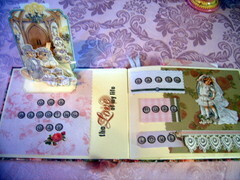 I'm looking forward to prettying up my blog. Wish me luck.